Ten years after French president Jacques Chirac and France’s UN ambassador Dominique de Villepin made an impassioned stand in the United Nations against the US-led invasion of Saddam Hussein’s Iraq over the issue of weapons of mass destruction, France finds itself as the chief European ally in US president Barack Obama’s push to punish the Syrian regime of Bashar al-Assad for the alleged use of chemical weapons in Damascus late last month. 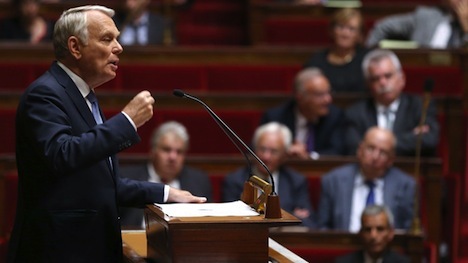 In a parliamentary debate in Paris yesterday, French prime minister Jean-Marc Ayrault (pictured above) made a strong case for intervention for the purpose of demonstrating the international community’s credibility in deterring the use of chemical, biological and nuclear weapons in the future. Center-right legislators in the Union pour un Mouvement Populaire (UMP, Union for a Popular Movement), including the UMP’s parliamentary leader Christian Jacob, argued just as forcefully that French participation in a US-led strike against the Syrian regime of Bashar al-Assad — without the authorization of the United Nations Security Council — over the use of chemical weapons would isolate France’s role in the international community. Although Chirac and the UMP also opposed unilateral intervention in Iraq in 2002 and 2003, it’s ironic that the UMP has suddenly found itself as the voice of opposition to Hollande because no one is more responsible for the transformation of France’s newfound assertiveness in world affairs than former president Nicolas Sarkozy, who succeeded Chirac in 2007, who struck a consistently muscular posture on foreign affairs. Sarkozy, always keen to rejuvenate Franco-American relations, took a starring role alongside Cameron in the UN-backed NATO campaign to enforce a no-fly zone against Libyan leader Muammar Gaddafi in 2011 and support anti-Gaddafi rebels in Tripoli and Benghazi. Had he won reelection in May 2012, Sarkozy would likely be just as enthusiastic as Hollande to support Syrian intervention — probably more so given the opportunity to supplant the United Kingdom as Obama’s chief partner. Some former Sarkozy officials, notably former foreign minister Alain Juppé, support France’s forward role in Syria. But Sarkozy, who may run again for president in 2017, has been uncharacteristically quiet on France’s role in any military action against Syria. Silence or not, it’s the UMP’s Sarkozy who put France on the path to a more aggressive foreign policy, in part by returning France to NATO’s military command after a 40-year absence. Since the start of Syria’s civil war two years ago, both Sarkozy and Hollande have called for Assad’s removal, and Sarkozy helped lifted the EU arms embargo on Syria to allow weapons to the anti-Assad opposition. 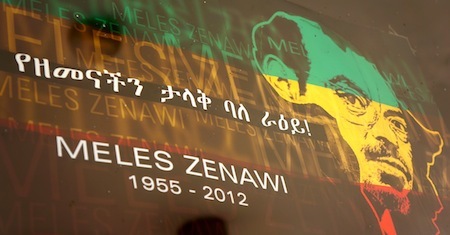 Although Meles Zenawi died in mid-August, he’s still very much an active presence in Ethiopia — so much that he still eclipses his successor, prime minister Hailemariam Desalegn. 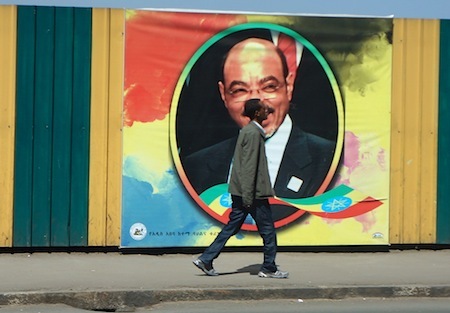 Not to be flip, but I know a personality cult when I see one — and no matter where you go in Ethiopia, Meles follows. He looks down from large signs, not just in the capital of Addis Ababa, but far beyond throughout the Amharic and Tigray hinterlands of northern Ethiopia as well. He’s also on dashboards of vehicles, and he graces storefronts, the stalls in labyrinthine markets and insurance companies, not to mention government offices and museums.. In downtown Addis, near the Hilton, there’s an entire wall featuring a dozen or so larger-than life panels picturing Meles. In the ten days I spent in northern and central Ethiopia, I found much in the country — 85 million people and growing fast — and its people to give me hope about the country’s future, but I also saw a lot of room for institutional improvement — in education and literacy, in transportation and infrastructure, in providing services to improve health and lessen poverty, and also in building more robust democratic institutions and better regional relations. 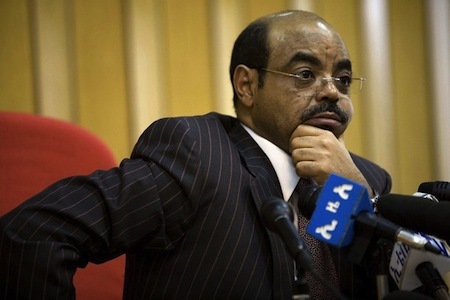 The prime minister of Ethiopia, Meles Zenawi, has died after a long illness. He was 57. Deputy prime minister Haile-Mariam Desalegne will be sworn in as acting prime minister. 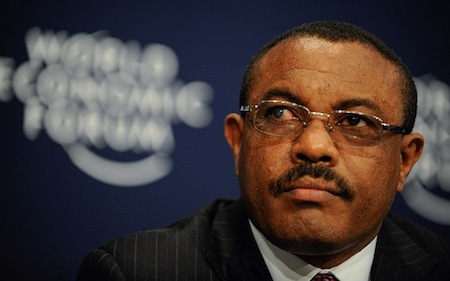 Since taking power in 1991, Ethiopia really hasn’t known a leader in the post-Cold War era other than Meles. He inherited a country decimated from a grinding famine in the 1980s and a war with Eritrea (that resulted in Eritrea’s independence in 1991) and transformed it into a stable regional power in a country that’s relatively untouched by the colonial experience, but which is the second-most populous African nation after Nigeria. Meles’s death comes just days after the death of the patriarch of the Ethiopian Orthodox church, Abune Paulos, at age 77, who was himself appointed by Meles. Meles came to power after participating in the coup that removed Mengistu Haile Mariam, a leader of the Derg that governed Ethiopia from 1974 to 1987 — Mengistu ruled in his own right through 1991. He presided over the writing of a new federalism-based constitution for Ethiopia in 1994, and he kind of opened Ethiopia to the ritual of regular elections, however rigged in favor of Meles. In his last election in 2010, Meles and his Revolutionary Democratic Front (EPRDF, or የኢትዮጵያ ሕዝቦች አብዮታዊ ዲሞክራሲያዊ ግንባር) won the majority in the Ethiopian parliament, despite widespread allegations of fraud. His victory in the relatively fairer 2005 election was met with massive — and sometimes violent — protest, which Meles met with a general crackdown on political dissidents. For all the stability that Meles brought to Ethiopia, democratic norms and institutions were not among his chief reforms. For example, opposition leader Birtukan Medeksa was imprisoned from 2007 to 2010.